I applied to be the Director of the OPPerations Committee because I wanted to serve the organization that has given me so much and be an agent of the change that I wish to see. I first joined THON after transferring from the University of South Carolina during my freshman year and was fortunate enough to be selected to the OPPerations Committee for THON 2017. Soon after cleaning my first mat and hauling my first trash bag, I knew that the Big Blue Family is where I would always belong. Before I became a member of the THON community, I never had a family of friends so close, knew the leaders and heroes that inspire me, or felt a passion and hope that has shaped the person that I am today. As a captain for THON 2018, I saw even more of the limitless devotion and strength that THON Volunteers put into creating magic For The Kids each THON Weekend and beyond. My experiences with THON have shown me that there is nothing that I would rather devote myself to. As the director of the OPPerations Committee for THON 2019, my hope is to devote myself to creating the magic that THON has shown me year after year. 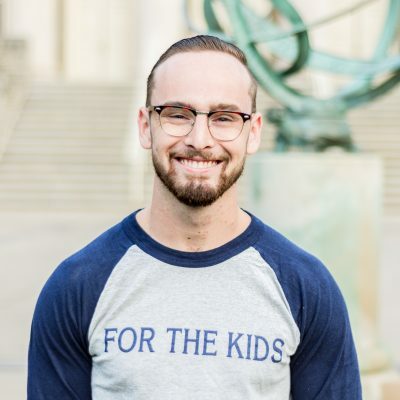 What are your main duties as the OPPerations Director for THON 2019? As the director of the OPPerations Committee, I am responsible for overseeing the safe and efficient set up, tear down, and operation of the THON 5K, Family Carnival, and THON Weekend. This involves the planning and execution of these events with the help of a strong collaborative relationship with Bryce Jordan Center and Penn State OPP staff. Throughout the year, I will work with the 21 OPPerations Captains to successfully develop and run these events as they pursue the duties and projects that come with each of their unique positions. In addition to their captain positions, these 21 captains will prepare each of the 777 OPPerations Committee Members for their role in setting up, running, and tearing down the best weekend of the year. In recent years, the OPPerations Director has had the opportunity to progress THON’s Sustainability mission and Zero Waste Initiative. Through a collective effort across the entire THON community and the Penn State Sustainability Institute, the THON 2018 OPPerations Committee was able to report Zero Waste Status at the THON 5K and Family Carnival with expectations of Zero Waste at THON Weekend 2019. My favorite THON memory was created during the third phase of THON Weekend 2018 Tear Down. The third phase of THON Weekend Tear Down is the final task before THON Weekend comes to a close until next year. As soon as the year’s total goes up and the dancers exit the BJC, OPPerations Captains and Committee Members get to work returning the BJC to perfect condition. OPPerations Captains and Committee Members roll mats, run trash, spray, sweep and mop all over the BJC late into Sunday night. After a physically and emotionally draining weekend, tear down can be an exhausting time. However, right around 11:00 PM, an assembly line of a hundred or so OPPerations Committee Members, Captains, and Directors from a handful of committees formed to move supplies into a truck. Completely unplanned and unprecedented, no one could quite say why the assembly line was created but the energy that it sparked was incredible. Even after hours of tiring work, every person in the assembly line found the strength to cheer each time a roll of toilet paper was stacked into the trailer. Between rolls of toilet paper, captains ran Slides of Strength on the truckway floor and a certain THON Advisor chanted ‘We want the trash’ while ‘Africa’ by Toto echoed through the Event Level of the BJC. The cheering, singing, and supplies continued into the night until each trash bag and soap bottle made its way onto the truck and the assembly line had nothing left to load. I think this is my favorite THON memory because its one of unplanned miracles that come from THON. In all the exact timelines created and meticulous preparations made for tear down, an assembly line was never mentioned. Singing and chanting hours after the dancers sat down was never expected yet all of these people decided to come together and turn a truck loading into a celebration. Every person in the BJC by then had every reason to be exhausted but that Third Phase assembly line reminded me that exhaustion would never keep the spirit of the Big Blue Family down.